Bronze medalist Alexander Naddour of the United States stands on the podium for the national anthem at the medal ceremony for Men's Pommel Horse on Day 9 of the Rio 2016 Olympic Games at the Rio Olympic Arena on August 14, 2016 in Rio de Janeiro, Brazil. Alex Naddour’s bronze medal on the pommel horse Sunday in Rio was significant in many ways. Not only did it finally put the U.S. men’s gymnastics team on the medal board in 2016, but it also gave Team USA its first medal on pommel horse in 32 years. In the 1984 Los Angeles games, Peter Vidmar won gold for the U.S. and Tim Dagger claimed bronze. A pommel horse medal was elusive since the 1984 Games, and was elusive before them, as well. You would have to go all the way back to the 1932 Games to find another U.S. medalist on pommel — Frank Haubold. 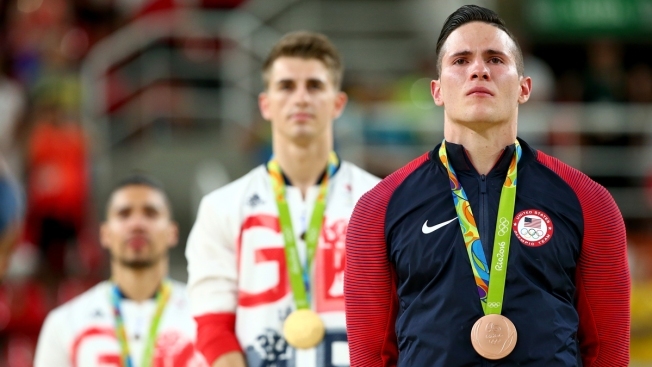 Naddour’s strength is pommel horse, and the 25-year-old Arizona native displayed all of his skills in Rio to claim bronze behind Great Britain’s Max Whitlock and Louis Smith. Naddour is a four-time national champion on the pommel horse.